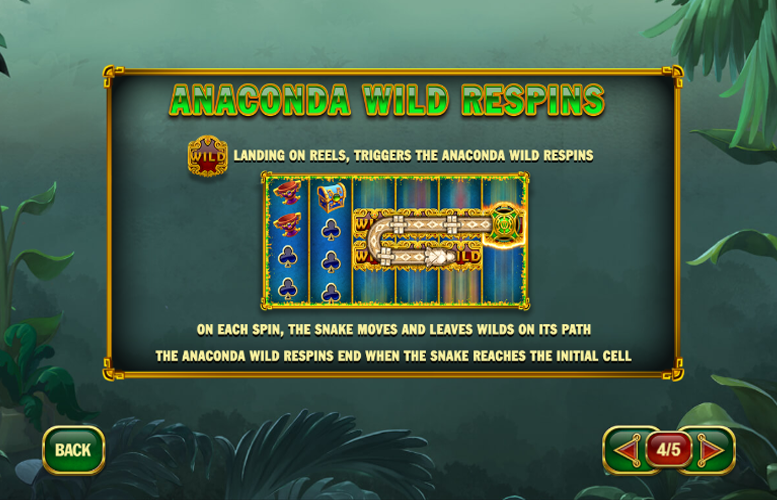 The Anaconda Wild slot machine by Playtech takes players to the heart of the jungle in search for the Anaconda Queen’s treasures. On most jungle treks, you’d be well advised to stay clear of the snakes lurking in the trees, however, here they’ll help you win big prizes! The game itself is played over a six by four grid. There is a total of 50 fixed win lines that players must match symbols along to receive payments. Anaconda Wild also offers a rather unique special feature but we’ll cover that and more below! Great special feature. We particularly enjoy games where the bonus mode matches the theme of the slot in some way. The old-school Nokia-style “Snake” dynamic works excellently here. Solid artwork and animation. It might not be the flashiest slot machine around but there are no quibbles with the illustration or art style of Anaconda Wild. Great for high rollers – if you can afford £2,500 per spin, this could be the game for you. The highest value prizes on the Anaconda Wild game are awarded for matching six-of-a-kind of one of the more valuable symbols along one of the 50 win lines always active on the title. These are represented by artefacts found in the Jungle Queen’s court and have all been rather tastefully illustrated. “Wild” = 1,000x the total bet. Jungle Queen = 600x the total bet. Treasure Chest = 160x the total bet. Goblet = 120x the total bet. Coin = 120x the total bet. Dagger = 80x the total bet. Ring = 80x the total bet. Any special “Wild” symbol that lands upon the reels will trigger the Anaconda “Wild” Respins. On each spin, the snake will move around the gameboard and leave “Wild” symbols on its path. After each move, additional wins are added to the total bonus feature win amount. This mode ends when the snake reaches its starting cell once again. Additional Anaconda respins can be triggered indefinitely during this mode too. 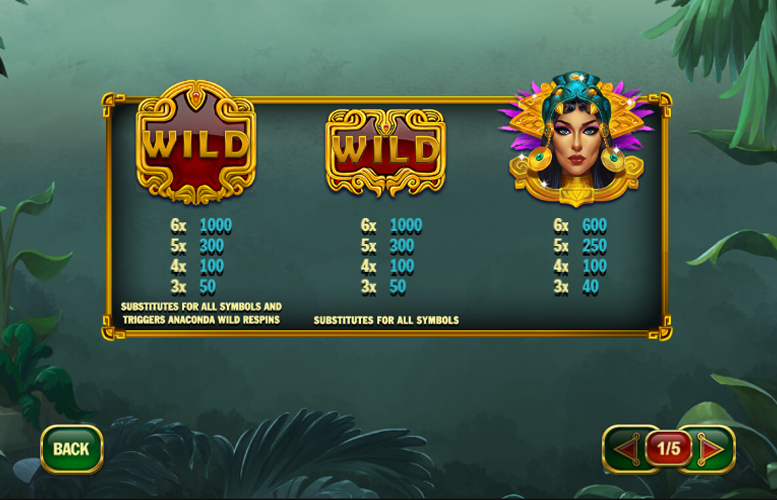 Along with the higher value symbols on the Anaconda Wild slot machine, there are also some icons that award lesser prizes. These are represented by the four suits in a standard deck of playing cards (Hearts, Diamonds, Clubs, and Spades). Spade, Heart, Diamond, Club = 50x the total bet. 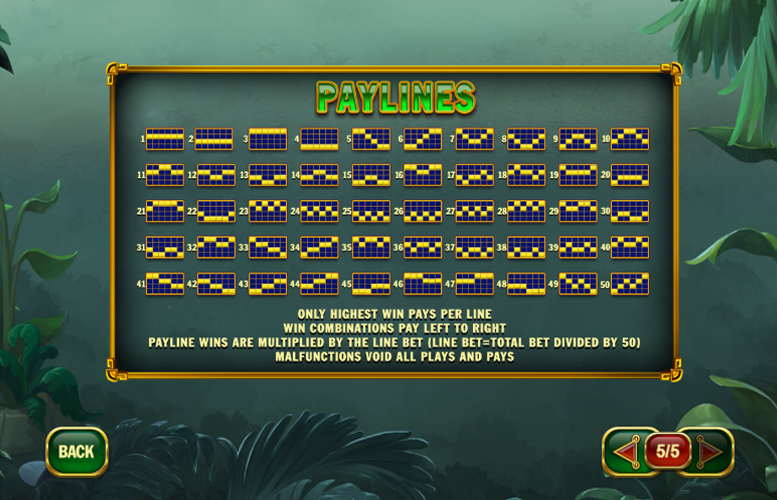 Players are given limited options when it comes to varying their bet sizes and distribution on the Anaconda Wild slot machine. They are not invited to adjust the number of win lines played on the game – these are fixed at 50. The only figure that they can change is the size of the total bet amount spread across all these win lines. Here, the minimum figure is just 25p. Meanwhile, the maximum is an impressive £2,500. Evidently, Playtech had the highest rollers in mind when they created the Anaconda Wild machine! 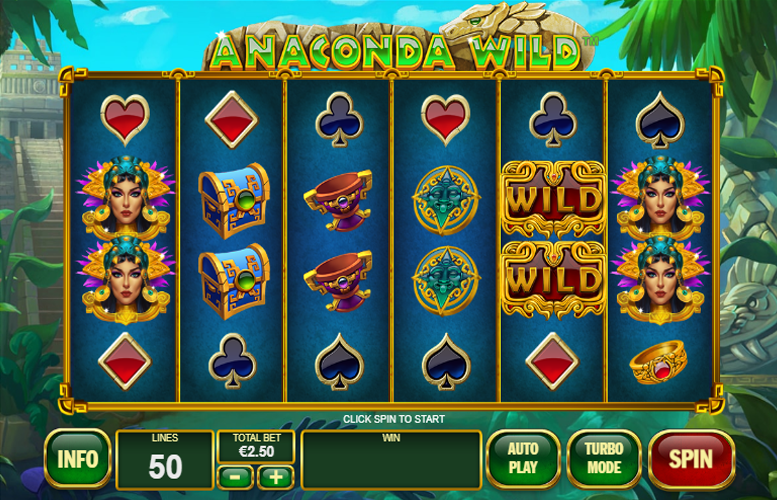 All told, the Anaconda Wild slot machine is a great game for a quick punt. It looks good and the special feature is genuinely exciting – at least for the first few times you play it. However, since this is the only thing that makes the gameplay of the slot stand out, it will get old rather quickly. That said, the slot does serve high stakes players excellently with its bumper upper betting limit of £2,500. If you have mega bucks to bet, this could well be the game for you! This game has a rating of 1 / 5 with 3 total reviews by the users.